I've been making so much girly stuff lately, I didn't know what to do for a special little guy who was born in January. I did what I do best and went straight to my trusty craft blogs. I found this tutorial over at Sumo's Sweet Stuff. I did a little more searching and found a template at Crap I've Made. Since then I've made my own template and found out what works best for me. 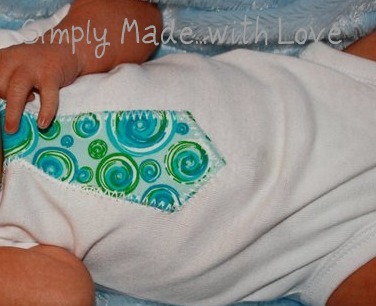 I love making these onesies and know many many more will be made this year! Enjoy! I made this recipe because we had family in town staying with us. I needed something for breakfast that I could prepare the day before. I had bookmarked this recipe a week ago from Cookbook Jungle. This was the prefect recipe and it left the house smelling delicious. It instantly became a new favorite recipe of mine. I loved this bread. It was a hit with the whole family. I will definitely be making this recipe over and over again. The only change I made was adding some brown sugar to the top of the bread before baking. It made the crust nice & sweet! In large bowl, combine first 5 ingredients. Add egg and oil; mix well. wire rack to cool completely. Since the weather has been so gorgeous around here, we had a cook out tonight. We've eaten out a bunch this weekend so I didn't want a heavy dessert. I decided on fruit with dip. I made this fruit dip from All Recipes.com. It was pretty darn tasty. I did make some modifications, which I noted below. This one would be great to bring to summer cookouts! Using an electric mixer, blend cream cheese and marshmallow creme until mixed thoroughly. **I folded in a container of cool whip to the mix and served. Baby Shower Recipe: Popcorn is one of my favorite snacks. A few weeks ago I tried caramel corn and loved it! I had a small bowl I wanted to use for the baby shower and thought a bag of popcorn would fit perfectly. This was an easy recipe and can be made a thousand different ways. Enjoy! 1. Pop the popcorn as directed on the bag. 2. Pour onto a cookie sheet and cool. 3. Melt chocolate. Heat 30 seconds, stir. Heat another 30 seconds and it should be melted perfectly. 4. Drizzle over popcorn. Add sprinkles. 5. Allow popcorn to cool completely. Store in an air tight container until it's time to serve. Baby Shower Recipe- I needed a side to go with the subs we had at the shower. I love pasta salad. Since I had to make all the dishes the night before, this one was perfect for the menu. I loved the pasta I used and hubs and I had the leftovers for lunch and dinner. Directions: Mix all ingredients together. Chill overnight. Serve & Enjoy! Baby Shower Recipe- This is my first try at cake pops and cake balls. I will admit that they were a little more difficult than I had thought they would be. I used Bakerella's basic cake pop recipe. I used a box of vanilla cake and vanilla icing. I cooled the cake balls over night before dipping them in the pink melted candy. A few of my pops didn't make it through the dipping process, but it was worth it for the ones that did. They were a hit of the baby shower! No doubt, I'll be making these again...and again! Why couldn't I have invented these??? Oh why oh why? Baby Shower Recipe- I love spinach dip. I usually buy it at the store, I've only made it once from scratch. I didn't want to do a store bought dip for the baby shower I was throwing. So, I set out on a search for a spinach dip with great reviews that looked simple to make. I found the recipe I decided to make at All Recipe.com. It had lots of great reviews and honestly, I couldn't say no to a recipe titled Best Spinach Dip Ever! And.....after making it. I have to AGREE! It's amazing. Will be the recipe I'll use from here on out for spinach dip. I'm actually eating it leftover right now. You've got to try this recipe! In a medium bowl, mix together mayonnaise, sour cream, dry leek soup mix, water chestnuts and chopped spinach. Chill in the refrigerator 6 hours, or overnight. Remove top and interior of sourdough bread. Fill with mayonnaise mixture. Tear removed bread chunks into pieces for dipping. Baby Shower Recipe-I had a chip and dip bowl that I didn't want to put dip in, so I decided to go with a cheese ball and crackers. I found the recipe on Martha Stewart's website. This was my first cheese ball and it was pretty easy. I know there are tons of cheese ball variations out there and I'm looking forward to making them. Enjoy! In a large bowl, with an electric mixer, beat cream cheese with cheddar, mustard, Worcestershire sauce, and a generous pinch of pepper until well combined. Mix in 1/4 cup pecans. Cover cheese mixture with plastic wrap, and chill at least 2 1/2 hours or up to overnight. Divide the cheese mixture in half, and shape each half into a ball. Spread remaining 3/4 cup pecans on a plate, and roll balls in pecans to coat completely, pressing nuts to adhere. Serve chilled. I made this punch for a baby shower I threw. It was the drink of the afternoon. Everyone asked what was in it and it's so simple to make. Enjoy! Pour soda into punch bowl. Empty carton of sherbet into the bowl. Slightly mix. Top with slices of lime. I found this chicken recipe a few weeks ago through a blog hop. I immediately bookmarked it and made it last week. It was really good. When I make it again, I will use a little less sour cream. I didn't add the melted butter, and didn't think anything was missing. I served it with brown rice and think some peas would compliment this dish as well. Enjoy! Precook chicken in boiling water until thoroughly cooked. Remove from water and let cool. Tear or chop chicken into small pieces and cover the bottom of a casserole dish. Mix cream of chicken and sour cream in a separate bowl then spread over chicken. Sprinkle poppyseeds over the top. Drizzle melted butter on top. Place in preheated over for 30 minutes. This is what I made for hubs for our first Valentine's Day as Mr. & Mrs. I cheated with this recipe and used pre-made cookie dough. I had a heart shaped pan that my mom had given me for Christmas. I sprayed the pan and pressed the dough in. That's pretty much it. I baked it for 15 minutes and let it cool in the pan for about 10 minutes. I carefully flipped it over and set it on the plate I served it on. After the cookie cooled completely, I added decorations with frosting (store bought). I honestly never thought I could make a cookie cake this easily. Hubs was convinced it was from the store. It was pretty darn good. Valentine's Day dessert- accomplished. Who doesn't love Bakerella? If you haven't heard of Bakerella, you've got to check her out! I was in search for a few easy Valentine's recipes for D and I to bring to work and this is one I decided to go with. I would call this recipe semi-homemade. Especially since I REALLY cheated and used cream cheese icing instead of making my own. Happy Valentine's Day! I can't think of anything sweeter than to share a savory chocolate recipe from Betty Crocker. I made these beauties for the hubs to bring to work today. Of course we tested them out before sending them in! Trust me, they are as good as they look! Enjoy! Line 24 miniature muffin cups with paper baking cups, or spray with cooking spray. Make cookie dough by blending cookie mix, cherries, oil, cherry juice, almond extract and egg until soft dough forms. Spoon dough into each muffin cup filling each about 3/4 full. Bake at 350°F 12 to 14 minutes or until dough is set. Cool 20 minutes. Remove from pan. Place cookies on cooling racks. Heat 3/4 cup of frosting on High for 30 seconds; stir. Dip tops of cookies into frosting. Allow to set about 1 minute; top each bite with cherry. I found this Campbell's recipe in a recent cooking magazine. It was a great meal for a chilly night. We ate ours with some tortilla chips. Next time, I'm going to make this recipe in the crock pot so it has a longer time to cook. Overall, it's a new dinner added to the menu! Heat the oil in a 4-quart saucepan over medium-high heat. Add the chicken, chili powder, cumin, onion and pepper and cook until the chicken is cooked through and the vegetables are tender, stirring often. Stir the soup, water, corn and beans in the saucepan and heat to a boil. Reduce the heat to low. Cover and cook for 5 minutes, stirring occasionally. Sprinkle with the cheese. Yield: 6 servings (about 1 1/4 cups each). I came across this recipe last night through a link up. It was perfect timing because I was heading to visit some friends. I had all the ingredients for this recipe and thankfully it didn't require a lot of time. I decided to cut the dough in half to form mini crescents because I wanted more than 8 pieces. These came out so good. They were still warm when I got to my friend's house, which made them even better. The recipe comes from Pillsbury and it will be one that will make frequent appearances around here from now on. You're going to want to add this one to the top of your recipe list! Enjoy. 1Heat oven to 350°F. Separate dough into 8 triangles. 2Place tablespoon of chocolate chips on wide end of each triangle. Roll up, starting at shortest side of triangle, rolling to opposite point. Place on ungreased cookie sheet. Bake at 350°F. for 15 to 20 minutes or until golden brown. Sprinkle with powdered sugar.